Mt. Thielson is a truly spectacular "horn" type mountain, much akin to Switzerland's famous Matterhorn. 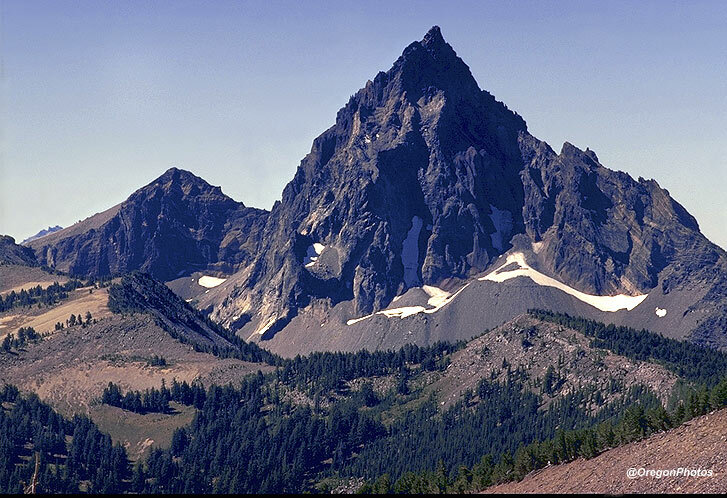 Image title: "Thielson North"
Unbeknown to most Oregon's mountain afficiandos, the southernmost glacier in Oregon lurks on this little-known peak, 9182 foot high Mt. Thielson. The glacier is Lathrop Glacier and is the larger of the two shadowed ice bodies in the center of the north face of the mountain. This is a view from the eastern shoulder of Howlock Mountain (8,350 ft).... This now-tiny glacier is a remanant of the last Ice Age (the "Little Ice Age," circa 1600-1900 AD-- for more on this, see page bottom).... Lathrop Glacier was at its maximum ice advance around the time of the Civil War. Sadly it is now wasting away more and more with each year, only a shadow of what it was when first identified and measured around 1900. The glacier is invisible from all the common viewpoints that the average tourist can easily access. To find this glacier view, I needed to hike cross-country, east off the PCT, climbing for over a mile with heavy photo gear. Click here for some views of one of Oregon's largest remaining glaciers, the Collier Glacier, in the Three Sisters Wilderness Area of Central Oregon. Mountain Climbing: One of Oregon's most terrifying first ascents was performed by some famed associates of mine on September 26, 1968. This was the first ascent of the sunlit ridge along the left center of the peak. The climbers were the Bauman brothers (Tom and Bob), and Gary Kirk. The route was dubbed the McLaughlin Memorial route, after climbing friend Mark McLaughlin, who died on Denali...Tom and Bob and their father Chet had made many previous climbs on Thielson during the early 1960s...... The image above will appear in an upcoming book, details to be announced at a later date. In the left lower side of the image above are the headwaters of Sink Creek. Down in the remote, trailess drainage I had the privilege of witnessing a Golden Eagle up close. It was on the ground near a small stream, maybe getting a drink. Quickly, it lurched into the air and buzzed straight over my head with its breath-taking six-foot wingspan. I felt the distinct rush of the passing airstream and imagined with fright the talons, long and razor-sharp. The mountain's steep horn and proximity to thunderstorm incursions from the east and south (California/Nevada) has rightfully earned the peak's nickname: "Lightning Rod of the Cascades." Examining the rocks on its summit, there are a frightening number of melted, glassy places! I have climbed this peak 14 times! Applegate Peak (8,126 ft) on the south rim of Crater Lake, near Sun Notch and Vidae Cliffs, peeks over the left shoulder of Thielson in the above picture. Images copyrighted. All uses and users MUST obtain my written permission via email at: brucej@oregonphotos.com. 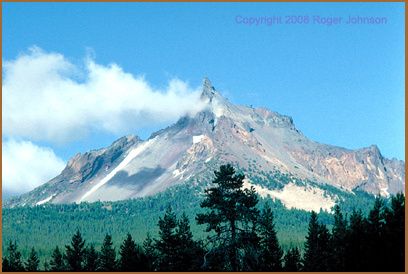 Persons who wish to display my images on their own websites must clearly credit "brucej@oregonphotos.com" as the source. Thank you. E-mail: Contact: brucej@oregonphotos.com, for a direct link for sales or gallery inquiries. "Thielson North" is sold as a custom 8x12 print for $25.00 plus shipping. Astronomy and Ice Ages: some theorists believe that variations in the Sun may be causative factors in Ice Ages on Earth. For example, solar researchers document an extremely unusual period they name the "Maunder Minimum," which coincided with the dates of the Little Ice Age in Europe, given by them as 1645 to 1715. As the name suggests, this was a period of very low sunspot activity; in fact, what is so extremely unusual was that apparently there were no sunspots at all during this whole time period of 70 years! (Astronomy Magazine, January 2000, pg 103). The LIttle Ice Age, circa 1350-1850. ....Studies of the Little Ice Age (LIA) in general have shown that it was some five hundred years in length, and was responsible for severely stressing and affecting any number of socio-cultural events during those five centuries, eg. causing Napoleon's giant invasion of Russia to turn into a horrific disaster of death for some 90% of his 600,000 strong army, through starvation and cold-related injuries, eg. hypothermia, frostbite, gangrene, etc..... Most agree that the LIA began to dissolve with relative rapidity circa 1850 and that ever since the World (or at least Europe and America) have been in a warm phase, or even a warming phase that is marked with "increasing warming" decade by decade. 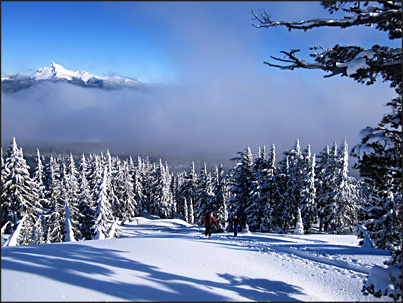 Nevertheless, the early weather records of the Pacific Northwest still hold a number of records for coldness and snowfall that still stand in 2010. For example, Portland's highest-ever annual snowfall of 61 inches occured back in the early 1880s, while some researchers still insist that the winter of 1861-62 was one of the most ferocious, damaging and long-lasting winters ever to hit the region. The Statewide giant arctic invasion of December 1919 set many all-time record low temperatures that still stand today. Studie of the LIA conducted in the Northwest, chiefly on the glaciers in the Washington North Cascades, show LIA effects extending much closer to the present than the Maunder Minimum... Their research finding that, depending on the glacier, the maximum advance occurred in the 16th, 18th, or 19th century. Further, they found that most glaciers in Oregon and Washington remained at "advanced terminal positions" all the way from 1650-1890. They also note that pioneer glacier photographers in the early part of the 1900s documented the glaciers still near maximums....But during the latter half of the 1900s, their studies show that of 47 Northwest glaciers being tracked for the past 40 years, none have advanced, none have stayed the same, five have vanished, and the rest are in full-scale retreat....I recommend this website, maintained by the Northwest Mountaineering Journal. In another LIA study, this one based on tree-ring analyses in Longmire, Washington, revealed that for the period 1590 to 1900, average annual temperatures were approximately one degree Centigrade lower than those of the 20th Century. While one degree C may not seem like much to have caused so much more glaciation, it may well have been combined with other factors, such as changes in the jet stream, increased annual precipitation, the sun's Maunder Minimum, etc. Click here for more on the Ice Ages in Oregon.